File this under shocking not surprising in the least. A security blogger has caught Arecont in an obvious lie with their recent advertisement. In the ad, they show an overview of a cafe. Within the overview are two circles - a larger one connected to a smaller one that presents a zoomed in view of a cashier handing a bill to a customer. If you are selling image quality and you say it's an 'actual' image, perhaps you should actually show the 'actual' image from the scene presented (the cafe overview). 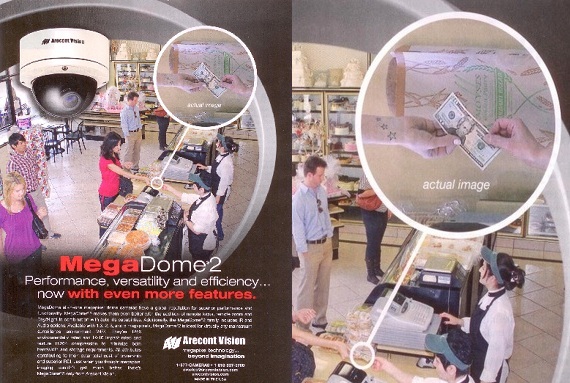 "Arecont Vision, I implore you to pull this ad or re-shoot it and do it properly." I second that but let's be realistic. This is Arecont Vision we are talking about. Under their scale, this doesn't register. Does it even compare to their fallacious megapixel math? I am happy to see more people speak out. This is what the industry needs to fight back against an industry dominated by malicious manufacturer marketing. This confirms how deceptive the ad is. A 5 foot wide FoV covering 2 cash registers is misrepresented with an overview shot of the entire cafe.